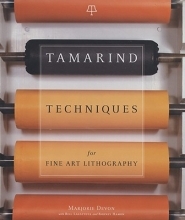 Founded in 1960, Tamarind Institute has had a major influence on printmaking in the twentieth and twenty-first centuries. Its mission - to shepherd lithography from obscurity to the vital role it plays in art-making today - has been accomplished with great success. This ambitious and expansive book offers complete, illustrated, step-by-step instructions for the range of fine art lithography techniques practiced today; up-to-date health and safety information about all materials and techniques described; and full-colour plates of more than forty years' worth of lithographs created at Tamarind by renowned artists and printers.The book's predecessor, "Tamarind Book of Lithography", has been a treasured resource in lithography workshops around the world for decades. Despite the obvious need for updating, it remains - over thirty years later - the fine art lithographer's main source for technical information. This much-needed new book provides current and detailed information about all traditional materials and techniques as well as those that have been developed since the early 1970s (there are many). Destined to be a classic, this book offers everything the original book did and more. There is not a fine art printer, printmaker or printmaking student at work today who will not want a copy of this invaluable manual. It promises to be the definitive guide for anyone interested fine art lithography.